Multi-screeners who text, shop, and browse the web while watching TV aren't as distracted as they might first appear. As the New Yorker has noted, the idea of the lazy, sedated couch potato has all but vanished from today's vocabulary. In 2016, people no longer passively watch TV with remote in hand. Instead, they're viewing programs while sending texts, buying clothes, browsing Wikipedia, and scrolling through their News Feed on Facebook. They're actively multitasking on two or more screens. They're engaged. Beyond the mere outline of a multi-screener, however, research from YouGov Profiles can help fill in the colours of this demographic — and reveals some unexpected shades. 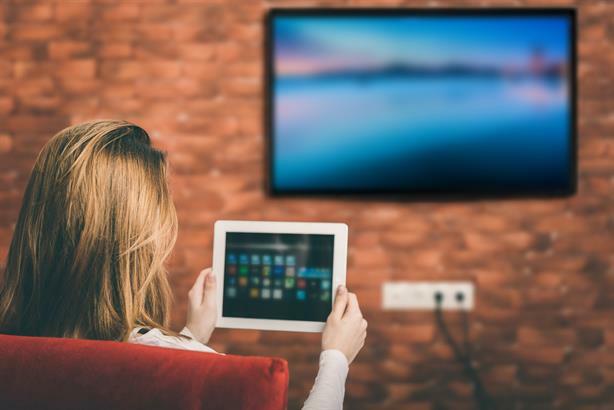 The multi-screener is defined as someone who tends to shop online, check social media, browse the internet, and text with friends or family — all while watching TV. The data reveals that this group is about two-thirds female, with 50 per cent falling between the ages of 18 and 34. The multi-screener's favourite shows, either streamed or watched live, include Orange Is the New Black, Scandal, The Walking Dead, House of Cards, and The Big Bang Theory. They're also an always-connected bunch, as 88 per cent say the internet is their primary source of information and 70 per cent admit they couldn't get through the day without mobile communication (for the general public, those numbers stand at 71 per cent and 48 per cent, respectively). In total, over 90 per cent of multi-screeners consider themselves either very or fairly internet savvy, while nearly 70 per cent say they're usually up to date with the latest technology. Although one might be tempted to conclude that multi-screeners are endlessly distracted by a steady stream of emails, alerts, and new links to click, data shows they're actually more observant than the average person when it comes to noticing advertisements. 64 per cent, for example, say they notice ads on public transportation, while that's true for only half of the general public. 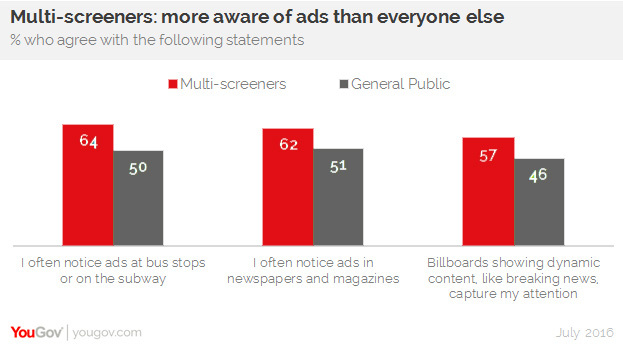 Beyond their mere receptiveness to advertising, however, multi-screeners also seem more likely to consider what other people — from peers to experts to strangers online — are saying about a particular product or service before purchasing it. 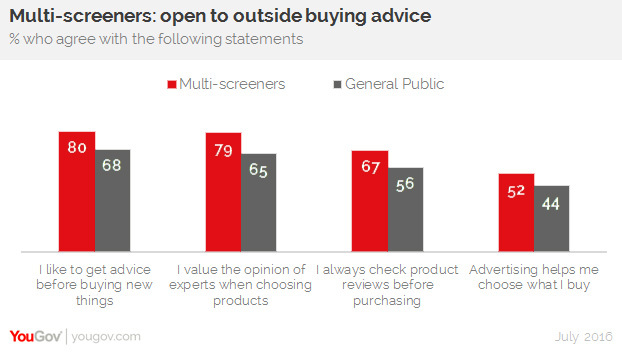 Even ads themselves seem to influence a multi-screener's buying process more than the average person's (52 per cent to 44 per cent). So, while people who stare at multiple screens tend to get a reputation for being distracted and fickle, data shows they might possess a greater capacity to both consume and process more information than one screen can offer. For the vigilant multi-screener, then, what might come across as too much discordant noise for the typical consumer is actually a harmony of sensible sound. For brands, big movements in popular perception happen regularly - from unexpected crises to planned product changes. Find out how these things impact on customer attitudes - and how you need to respond.